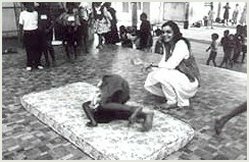 The USA in the summer of 1999, Anita Ratnam and two senior dancers of the Arangham Dance Troupe were invited by Bill Bissel, Administrative Director, and Mark Taylor, Artistic Director, Dance Alloy, Pittsburgh, for a 10 day movement encounter. Several absorbing hours went into an exchange of ideas on the basics of Bharatanayam and modern dance. Mark Taylor, Artistic Director, Dance Alloy, was deeply impressed by Bharatanatyam's lines, body alignments, the intricate wrist, finger movements and variety of facial expressions, as also the systematic training that organised body movements. 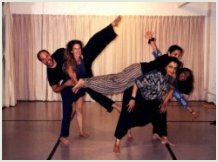 Both groups attempted to process each other's etudes and further went onto explore the principles of contact improvisation, how the dancer handles his weight and that of a partner's. Narendra and Aarti of Arangham, appreciated Mark's open-minded approach and felt his work helped them think more deeply about movement, since "he even studies how the bones, muscles and nerves function, whereas we just forcibly move our hands and fingers!" The interaction also stimulated their minds to new choreography, building stronger bridges of cultural commitment and artistic endeavour. "Phrases" of modern dance were combined with Bharatanatyam "adavus" (etudes) and a delightful vignette of urban friendship between a boy and a girl was created. "Ta-ki-ta-tease" covers the gamut of emotions experienced when boy-meets-girl for the first time, with its flamboyance, self consciousness, little tugs of jealousy and generosity and the chronic desire to impress! This was the first phase of the encounter. A second more exhaustive contemplate occurred from Dec 13-16, 2000. Mark Taylor visited Chennai at Arangham's invitation, to impart and fine tune movement skills for a three day intensive workshop in the city.